Jewel toned, metallic and life proof.. the new additions to Sleek couldn’t have come at a more festive appropriate time. I know we all think about adding a little sparkle to our makeup at this time of year, but Sleek have really upped the anti with their latest collection; if you’re trying to emulate the actual colours of a Christmas tree in your makeup this season (i know i always am) then keep reading..
Christmas themed references (ish) aside i really love this new collection, it’s nothing like what i would usually wear – i’m very neutral in my makeup usually, but there’s something about the jewel toned midnight blues, purples and those metallic red’s that convinced me this collection was for Christmas (even if it wasn’t actually intended for that). I had to start off with my favourite thing from the entire line up, the i-Lust Into the night bronze eyeshadow palette. I mean really, if there’s an eyeshadow palette we all know i’m reaching for that first, especially if said eyeshadow palette is filled with golden shimmers. Usually i don’t wear creme eyeshadows as anything other than a base, but these colours are obviously meant to be seen so i went straight in with using this and i am in love. Although these are cream they’re actually a really unique formula, they almost turn into a powder formula on the lid which makes them incredibly pigmented and not chunky like other cream shimmers i’ve tried. 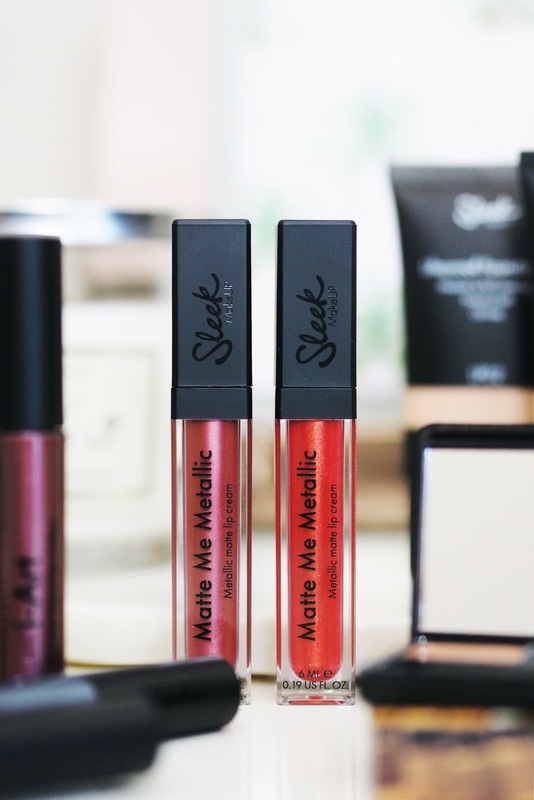 Sleek Matte Me lip creams are one of my favourite liquid lipstick formulas out there, especially because they’re so affordable, so i was pretty intrigued at the metallic version from the new releases. I have the shades “Metallized Rose” which is a beautiful rich pinky purple and “Molten Topaz” a metallic version of a pretty classic Christmas red. The pigment of these is just incredible, the swatches talk for themselves, you only need a really small amount of product to get complete full coverage from these lipsticks. Like i said above the original matte me lip creams are one of my favourite formulas because they’re not overly drying and i don’t find these drying at all, they’ve got a good lasting power too which is exactly what you need during the party season. These aren’t a crazy glittery shimmer either, they just give a little bit extra; I think i’ll wear the red on Christmas day, it’s already a perfect classic “Christmas day red” but the metallic just gives it something special. If you’re thinking an entire metallic lip might be a little bit too much for you, you could use them as a lip topper in the centre of your lip under your regular lipstick to still get that shimmer effect. Top to bottom: Strobe dome, Metallized rose, Molten Topaz. We all know i’m a lover of high end foundations but i’m also a lover of a bargain, so any drugstore foundation that promises to be high coverage and long lasting i’ll be the first in line to try it. Foundation is a serious business to me, i’ve tested so many that i can almost tell what they’re going to preform like when i’ve only squeezed them onto my hand, on first impressions the two things i noticed about the Lifeproof foundation was it’s coverage and texture. This is a liquid foundation but it’s not “liquidy”, while it’s not crazily thick you could put a bit of this on your hand and not have it slide off (it’s actually a pretty similar texture to the Urban Decay all nighter so if you’re a fan of that, this might be a great cheaper option). With thicker foundations it’s always worth using a hydrating primer underneath no matter what skin type you have, it’ll help to smooth everything out and avoid a matte foundation caking or clinging to patches. If i’m honest i’m usually very skeptical about cheaper foundations as they never really live up to my expectations, but i was pretty surprised by this. The coverage is there and it’s definitely buildable without being cakey, and once set with a powder you get a really decent finish; i find a good finish is something that cheaper foundations struggle with, but this is better than a lot of others that i’ve tried. I wouldn’t however say this is as long lasting as a high end foundation, but really for £8.99 you cannot complain, for that reason i’d say this is a perfect everyday foundation. For days when i don’t want to spend 2 hours out of the house and waste my ridiculously expensive foundation, i will 100% reach for this, especially because i know i don’t have to worry about not having enough coverage. It’s also worth mentioning these come in 24 shades which is unheard of for cheaper foundations, other brands could learn a thing or two from Sleek when it comes to catering for darker skin tones. I’ve actually tried similar products to the Strobe dome before and i’m definitely more of a fan of these in summer, however if you’re someone who favours a light base all year round with a subtle glow this is the product for you. Although it looks quite bronzy in the dome it’s actually more of a rose gold pink shimmer which i much prefer to proper bronzy tones, it’s also really multi use too – i’d use this in multiple areas of my face but also on the eyes as well! The reason i say light base is because of the tendency products like this have to break up whatever product is underneath them, but i do find tapping this in with your fingers rather than using a swiping motion helps to apply and build up product without disrupting product underneath. When i first saw these i-Art precision liquid eye colours i have to admit i didn’t actually know what they were, which sounds stupid but let me explain: i didn’t know whether they were a liquid eyeshadow or a liquid eyeliner. I’m pretty sure these are meant to be liquid liners because of the precision wand applicator but i don’t really think there’s anything stopping you using these as liquid eyeshadow either. The swatches do all of the talking here (excuse how messy they are) but you can really see how the colour comes through with these even with darker shades, sometimes colour can be lost with darker colours but each and everyone is really pronounced. Obviously the purple and blue shades wouldn’t be worn on a daily basis (i mean i wouldn’t, but you do you) but i think they’re fun to have in your collection for when you’re doing a more “out there” look.. saying that though the tones aren’t too extravagant so they actually work out to be quite flattering. Top to bottom: Orphism, Surrealism, Futurism. What do you think of Sleek’s new releases? Disclaimer: This post contains gifted items.